The article, from the Times of London, was scrubbed same day this went onto the blog (and from there, viral). Scientists have produced the first internal map of Eyjafjallajokull's network of magma chambers, which extend 12 miles below the ground. The map shows how the volcano's tubes plunge deep down through the earth's crust to the start of the mantle, which is made of semi-molten rock. It reveals the huge scale of the eruption and the potential for a far greater one. This is because the magma chamber of Eyjafjallajokull is dwarfed by the much larger one under Katla, a volcano 15 miles to the east. Two of Katla’s eruptions, in 1612 and 1821, are thought to have been triggered by those of its neighbour. The workings of the volcanoes have been provisionally drawn up by Professor Erik Sturkell, a geologist at the Nordic Volcanological Centre, University of Iceland. Sturkell suggests the Eyjafjallajokull eruption has been building since 1994, when new lava began rising, forming two reservoirs three miles beneath the volcano. They now feed into a much larger magma chamber a mile under the crater. A surge of earthquakes under Katla mean it has experienced a similar influx of lava, Sturkell said. "This suggests the volcano is close to failure [eruption]." awesome save! thanks for posting this. Wow, I wonder if we are looking at something the size of Yellowstone, or along that scale? Maybe we won't have to worry about the Boeing guy's warnings, seems like the Volcano's of our planet have an agenda. We won't need satalites as without sunlight life is toast! Maybe 2012 is NOT Solar nor POLAR, maybe it's simply a cycle this planet goes though every so often and maybe we are just NOT in the loop? i'm no expert by any means...but. from what i've understood...katla, if she blows, will affect our weather to some degree. colder summers, cloudy skies. crops will suffer everywhere, including us, especially here up north. but most drastically in europe i believe. food will become difficult to get and expensive, there will be ppl hungry, and sad to say, some will be starving. katla is big, however will not be the disaster that a super volcano would produce. like yellowstone and naples. those would be a different story altogether. i doubt many of us would survive, in the long term, one of those. just wanted to make sure ppl here knew this, just in case katla goes...which is a very good probability. do get going on some food/med reserves if you haven't already. but i might kick it. give a yell if you need any help. if i knew then what i know now, i'd probably save myself quit a bit. Uh hmmmmm - no talk about lickin' butts this early in the morning! that's ok, L. I kinda figured that's what you meant. bb's right. it's pretty apparent when you haven't had your coffee yet. you were misspellingmisspeaking all over the place this morning. i kinda like it like that. makes the morning more fun. and glad you've already gotten to your storage supplies. from an earlier post i was under the impression you hadn't done much yet. my bad. I just found this one, what a hoot!! Hat tip to Cosmic Bee @GLP. It appears to be choose your doom day today. What with disappearing N Korean subs and Israeli war plane fired on in Lebanon and now this! Fears are growing that the Katla volcano in Iceland could erupt in the coming days after volcanic activity at the site increased by over 200% in recent days. Geophysicists at Iceland’s Institute of Earth Sciences say Katla will be locally and globally damaging. Seismic readings of the volcano in recent days indicate the tremors around the area have increased substantially. The last earthquake to take place at the volcano was recorded this morning. The eruption of the long-dormant Eyjafjallajökull volcano has prompted fears among some geophysicists that it might trigger an eruption at the larger and more dangerous Katla. In the past 1,000 years, all three known eruptions of Eyjafjallajökull have triggered subsequent Katla eruptions. The last large eruption at Katla was in 1918 but there have been small eruptions at Katla as recently as 1955. An eruption of Katla volcano has the potential to be more devastating than the current eruption of Eyjafjallajokull. Icelandic President Ólafur Grímsson has warned Governments around Europe that a significant eruption at the volcano is ‘coming close’. He said: "We [Iceland] have prepared ... it is high time for European governments and airline authorities all over Europe and the world to start planning for the eventual Katla eruption". In the past 48 hours 3 earthquakes occurred at Katla volcano, Iceland. The earthquakes may be due to ice movements within Mýrdalsjökull glacier or magma movement under the volcano. Scientists have been keeping a close watch on Katla volcano, due to the possibility of an eruption triggered by the activity at nearby Eyjafjallajokull. An eruption of Katla volcano has the potential to be more devastating than the current eruption of Eyjafjallajokull. It may be a really cold summer for us all, freak! I pray this is just ice movement and not magma. you know what's worse then that Australia is in the season of WINTER Aww.. Noo!!! I completely forget that your season's are opposite ours!!! Hat tip to AC @ GLP for this! Gulp!!! 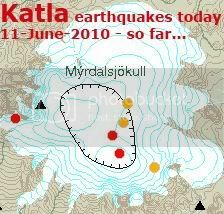 Friday, 11-June-2010, 07:03 this morning, an earthquake shook at the Katla volcano in Iceland. 10 seconds later, a slightly larger magnitude earthquake struck. 10 minutes later another earthquake trembled followed by yet a fourth earthquake hours later. As I was writing this, a fifth earthquake just popped off! Having been monitoring the earthquakes at Katla since mid May, these six earthquakes are the most in one day so far. This is just my observation as an interested amateur, and there is no evidence of swarming at this time (could this be the beginning of a swarm? ), but it is interesting to note today’s occurrence. We must keep our eyes on this potential disruptive volcano, Katla, that historically erupts following the eruption of Eyjafjallajokull (which first erupted April 14). Katla is about 10 times more powerful, and has the potential to cause worldwide disruption. Icelandic ash cloud part two? If you thought last year's flight-paralysing volcanic eruption from Iceland was bad, just wait for the sequel – that's the message from experts nervously watching the burps and rumbles of an even more powerful volcano. Brooding over rugged moss-covered hills on Iceland's southern edge, Katla is bigger than the nearby Eyjafjallajokul volcano, which spewed ash all over Europe for several weeks and cost airlines $2bn (£1.2bn). Named after an evil troll, Katla has a larger magma chamber than Eyjafjallajokul's, according to local scientist Páll Einarsson. Its last major eruption, in 1918, continued for more than a month, turning day into night, starving crops of sunlight and killing off some livestock. The eruption melted some of the ice sheet covering Katla, flooding surrounding farmlands with a torrent of water. Now, clusters of small earthquakes are being detected around Katla, which means an eruption could be imminent, seismologists say. The earthquakes have been growing in strength, too. After a long period of magnitude-3 tremors, a magnitude-4 quake was detected last week. "It is definitely showing signs of restlessness," said Einarsson, a professor of geophysics at the University of Iceland. Teams of seismologists and geologists at the university are tracking the spike in seismic activity and working with disaster officials to prepare communities near Katla such as Vik, a small town of around 300 people flanked by black sand beaches.